The independent oil giant is making progress on its turnaround plan. Like most oil companies, ConocoPhillips (NYSE:COP) got caught flat-footed when oil prices crashed a couple of years ago. As a result, it needed to make changes to align its business with the new reality of lower oil prices. The following five charts detail its progress on that mission. As the chart on the left-hand side notes, the company cut its capex by roughly two-thirds over the past two years. However, despite that steep spending cut, it is still projecting to grow production by 1% to 3% this year as noted on the chart to the right. Two factors drove this result. First, the company cut out unnecessary costs. Second, it became a much more efficient driller. Industrywide, efficiency gains are the big story during the downturn. An excellent example is shale-focused EOG Resources (NYSE:EOG), which cut its capex by 70% from $8.3 billion in 2014 all the way down to $2.5 billion this year. However, despite that huge cut in investment spending, EOG Resources' oil production has only declined 6% over that time frame. This is because it is drilling more productive wells than ever before thanks to using enhanced completion techniques, drilling longer laterals, and employing many of the other technical advances to target the best oil zones and coax more oil out of the ground. As a result, EOG Resources' completed well costs are down more than 20% while its production per well has doubled since 2014. That said, while the industry is more efficient at getting oil out of the ground, production costs have not come down quite as dramatically. Because of that, ConocoPhillips' cash flow is still feeling the impact of low oil prices. As that chart notes, ConocoPhillips produced $1.9 billion in cash flow from operations. However, it spent $3.6 billion on capex and dividends. That gap between cash flow and capex is partially due to the investment required to complete some of its major growth projects. That said, capex spending will drop even further once those projects are complete. COP Financial Debt (Quarterly) data by YCharts. 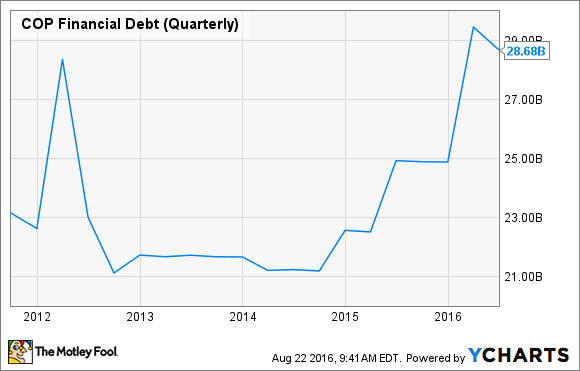 That is well above the company's target to keep total debt below $25 billion. Because of that, the company's priority in the near-term is to get its debt back down below that level. It made some progress during the second quarter with its outstanding debt falling by $800 million. Additional progress on debt reduction is expected this year given that oil prices are on the rise, and the company is on track to sell about $1 billion in assets. These charts show two things. First, ConocoPhillips is making clear progress on its goal to be able to run the company sustainably at much lower oil prices. That said, it still has more work to do because it is not cash flow neutral yet and its debt is well above its target. As a result, investors can expect the company to continue making the necessary changes to get it to where it needs to be.